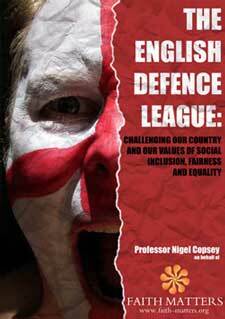 The English Defence League: Challenging Our Country and Our Values of Social Inclusion, Fairness and Equality. A detailed report on key leaders within the English Defence League, their funders and those that formulate its strategy. This report is a damning insight into a group that promotes a non-racist image, yet those aligned and linked to it hold views that are openly discriminatory against all Muslims and some speak the same language of the British National Party – the language of exclusionism, of non-equal human rights and of the need to ‘send people back.’ These values go contrary to what our country stands for and what we as a nation are about. We are about Fairness, Freedom, Hard Work, Equality and Social Inclusion. We are a modern Britain and a modern nation born from hard work and fairness!